SUNNYVALE, CA--(Marketwire - Sep 12, 2012) - Real-Time Innovations (RTI), the world leader in delivering fast, scalable communications software that addresses the challenges of building and integrating real-time operational systems, today announced Rheinmetall Defence Electronics GmbH has successfully used RTI Connext™ DDS to support interoperability between widely distributed military assets as part of the European Defence Agency (EDA) Future Interoperability of Camp Protection Systems (FICAPS) project. FICAPS shows how multi-national allies are able to share information in real-time -- amongst collaborating forces, in different locations and across different systems supplied by different manufacturers -- to improve communication and effectiveness on the battlefield. Interoperable control of effectors and sensors, including streaming video, between equipment based in France and Germany was successfully demonstrated. Rheinmetall developed the systems for the German site and worked with a French company who independently developed their protection systems. Both companies followed a common architectural infrastructure approach based on the open standard Data Distribution Service (DDS) and a common System Data Dictionary (SDD). 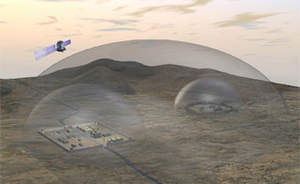 FICAPS demonstrated the remote control and use of these assets over fiber-optic and satellite links, including the sharing of live video feeds. Through the combination of powerful open standards middleware and a comprehensively defined semantic data model developed under FICAPS, it has been shown that independent camps can interoperate and share equipment. This interoperable open architecture is a direct result of one of the key lessons learned from the war in Afghanistan, where the inability to rapidly integrate multi-national assets constrained Warfighters' operational capability and agility. "RTI's fundamental understanding of interoperability and how to achieve it was of great benefit to our FICAPS development," said Karl-Hermann Stahl FICAPS Project Manager of Rheinmetall Defence Electronics GmbH. "Interoperability is at the heart of many of tomorrow's defence system procurements and Rheinmetall's proven capability with this project puts us at the forefront of future market opportunities." "Achieving interoperability between independently developed systems is hard. Add in the multi-nation context that EDA demands and you have raised the bar incredibly high," said Stan Schneider, CEO of RTI. "Rheinmetall has demonstrated a critical step forward in delivering agile operational capability for collaborative multi-nation military deployments." Rheinmetall Defence Electronics GmbH is one of Europe's leading providers of defence electronics and systems engineering for armed forces. The company offers ground-based reconnaissance systems, fire control technology, C4I systems, future soldier systems, guided missile platforms as well as simulation and training systems, test systems and technical publication services. Rheinmetall Defence Electronics has dedicated experience in the real-time data exchange and networking of military systems such as reconnaissance sensors, effectors and simulators. Headquartered in Bremen, the company is part of the Rheinmetall AG and international technology group for defence and automotive. RTI is the Distributed Systems Architecture company. RTI is the global market leader in fast, scalable, communications software that addresses the challenges of building and integrating real-time operational systems. RTI Connext solutions address the needs across the enterprise -- the infrastructure spans deeply-embedded and real-time systems all the way to enterprise software running across the web and at data centers. RTI's standards-based software infrastructure enables cost-effective, efficient operational systems while facilitating better actions and outcomes for the business enterprise. RTI's industry-leading products and solutions power critical applications for customers in markets ranging from Aerospace & Defense, Process Automation, Financial Services, Energy, Automotive, Health Sciences and Transportation Management. Founded in 1991, RTI is privately held and headquartered in Sunnyvale, California.